Authors: Salem, R.; Lenihan, A. S.; Carter, G. M.; Murphy, T. E.
Abstract: We report a new method for polarization-independent optical demultiplexing that uses cross-phase modulation (XPM) in nonlinear fiber. Using this technique, we achieved error-free 160- to 10-Gb/s demultiplexing in only 2 m of highly nonlinear bismuth-oxide fiber. The demultiplexing performance is not impaired when the input data polarization state is scrambled at high speed. 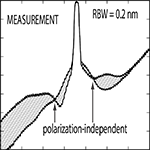 This method does not require circular polarization states and is shown to work even in birefringent fibers. We present a simple theoretical model that predicts the conditions under which polarization-independent XPM can be achieved, and we show numerical simulations that agree well with experimental observations.